Every woman is a SHERO in one way or other. Some SHEROES are so because they reach a high point in their professional lives while others are SHEROES because of the things they do and the way they are! In focus today, we would love to highlight Amelia Earhart, a SHERO who made waves around the world in the early part of the 20th century. Amelia Earhart was the first woman aviator to make a solo flying trip across the Atlantic. She was an American. Amelia first decided to pursue her education in the field of Medical studies but soon quit and went back home to her parents. While at home, a chance visit to an airfield in Long Beach changed her life. It was during her first air ride that she suddenly had the urge to ‘know how to fly’. She become so determined to achieve this goal that she struggled to save enough money, often taking up basic jobs as a Stenographer, Photographer and even truck driver to make this dream come true. She was so focused on her new found dream that she changed her overall image, even going to the extent of cutting her hair short and buying the right attire in order to look the part. On 15 May 1923 she became the 16th woman to be issued a pilot license by the FAI (Federation Aeronautique International). Amelia Earhart was the first woman aviator to fly solo across the Atlantic Ocean. In those days, women were still struggling to create a strong foothold in their professions. Being a woman and an aviator was in itself one of her biggest achievements. She also authored several books on her journeys and won a series of awards for her flying attempts. 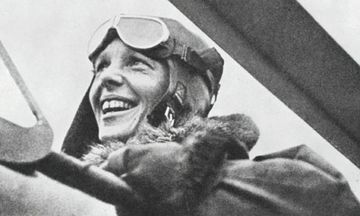 Amelia Earhart faced several struggles in life. It is only because she held onto the dream of flying that she achieved her goal. A successful woman who doesn’t allows her struggles to get the better of her is in every way a SHERO. Amelia was often bogged down by depleting family finances and a recurring sinus problem, she eventually had to sell the first Airster Biplane (nicknamed – Canary) that she had bought. She worked in various fields throughout her crises, this time opting to work as a teacher and then social worker. Amelia was the first person to fly the official flight out of Denison Airport in 1927. She wrote columns in the local papers about flying and aviation and soon became a local celebrity. Earhart came to be known as the Queen of the Air. She won the distinguished Flying Cross from Congress, the Cross of the Knight Legion of Honor from the French Government and the Gold Medal of the National Geographic Society from President Hoover. This was just the beginning, over the years she was accorded several more honours. Amelia eventually chartered other solo flights too. In 1935 she was the first person to fly solo from Honolulu in Hawaii to Oakland in California. She also flew solo from Los Angeles to Mexico and planned several other solo journeys by herself. The first time she saw an airplane, she was not impressed. Not only is Amelia Earhart known for her achievements as the first woman aviator and solo flyer, her sudden disappearance during one of her solo journeys caused a stir all over the world. In 1937 during an attempt to circumnavigate the globe she suddenly disappeared somewhere over the Central Pacific Ocean. Amelia was known for her grit and determination. She stood her ground in a male dominated world. One of her famous quotes ‘Woman, like men should try to do the impossible and when they fail, their failure should be a challenge to others’ is largely used as a reference example for young women and training pilots all over the world.